What does it take to be a successful real estate developer? 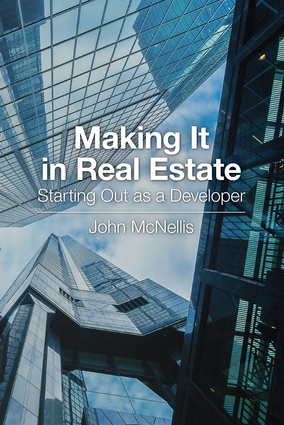 Author John McNellis tells you how, sharing practical tips and advice from his wealth of experience over 35 years in real estate development. Like meeting with a mentor over coffee, McNellis entertains with witty anecdotes, and wisdom on how to take advantage of opportunities and avoid pitfalls. Offering humorous insights, the book covers the ins and outs of how to get financing, working with architects, brokers, and other professionals, how to make a good deal, and win approval for your project. "John McNellis has a talent few other developers possess: he can swiftly cut to the chase to make a deal that works for both sides. He is among the best at knowing when a deal makes sense to pursue, or when to walk away and await the next one. If you want to learn what it takes to be successful in real estate, read this book." —James S. Fassio, President and Chief Development Officer, Ross Stores Inc.
"John McNellis's book on real estate development and investment is extraordinarily insightful and full of wisdom. His wit makes it an easy read. I would highly recommend this book to both experienced and beginning real estate developers and investors." —George M. Marcus, Chairman of the Board, Marcus & Millichap Inc. and Essex Property Trust Inc.
John McNellis is a principal with McNellis Partners, a commercial development firm he cofounded in the mid-1980s in northern California. After graduating from the University of California, Berkeley, and the University of California Hastings College of the Law, McNellis began his career as a lawyer in 1976 in San Francisco. Always more interested in business than in law, he started fixing up houses in his spare time and gradually worked his way to more complicated projects. At 28, he formed a partnership with an older client and began his career as a retail developer. Cobbling together the equity from friends and family, they built and opened their first shopping center in 1983, by which time McNellis was no longer practicing law—except on behalf of his own projects. Within a few years, he formed McNellis Partners with Beth Walter and Mike Powers. They continue to be partners more than 30 years later. Specializing in developing supermarket-anchored shopping centers in northern California, the partnership has followed a strategy of developing only about two projects a year and doing so with internal capital only, thus retaining 100 percent ownership of their developments. In recent years, the company has begun developing mixed-use projects and, in an effort to diversify, investing in small Silicon Valley office buildings.